The Ministry of External Affairs has organised a training course for the officials of the Government of Nepal under the Indian Technical and Economic Cooperation (ITEC) programme. A second group of 20 officials of Nepal's Ministry of Finance joined their training course on ‘Global Perspectives on Public Financial Management’ at the Institute of Government Accounts and Finance (INGAF) in New Delhi on Monday. This is a special tailor-made training programme on Public Finance Management designed at the request and requirement of the Ministry of Finance of Nepal for a total of 62 officials. The training will enhance the capabilities of these officials in global practices dealing with e-payment system, accounting & cash management, public borrowing system, accounting of foreign loans/grants and repayments, pension payment system, internal audit, fiscal responsibility and budget management, etc. 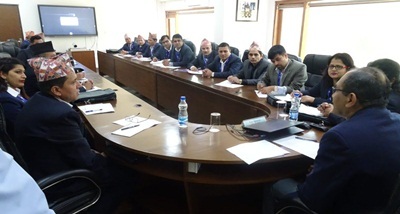 The first group of 20 Nepali officials had successfully completed their 10 day long training last month. INGAF is one of the Partner Institutes for imparting professional training to officials from friendly developing countries across the world under ITEC programme of the Government of India.